Do you like jogging? Or cardio? Then, the interval training treadmill workout adds challenge and excitement to your regular cardio routine – plus you’ll drop more pounds way faster! By the end of this page you’ll get a practical example of such a routine, along with six benefits of doing interval training on a treadmill. 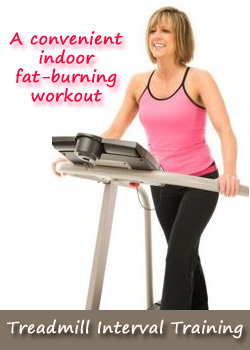 As you know, most treadmills come with various features that vary the workouts in numerous ways. Just play with the speed, intensity and incline levels to introduce variety to your indoor interval training workout. This way, you can enjoy the benefits of jogging without suffering the banes of bad weather. There are two key benefits to doing interval training, whether in the gym or at home. First, an interval training exercise increases the efficiency and effectiveness with which your body burns stored fat through the process known as excess post-exercise oxygen consumption (EPOC), process described when we discussed about what interval training is. Second, an interval training workout significantly improves your cardiovascular health. Why? Because your heart builds up strength and endurance especially during the high-intensity bouts of your workout. The workout variations you can do on a treadmill allow you to avoid boredom, hence increasing your motivation to exercise. As a result, you are more likely to follow through with your exercise program, which means more body fat burnt in the long run. There are no special skills or strength required in using a treadmill. You only have to walk and run, two of the most natural movements your body is able to do almost on instinct. You can personalize your workout according to your current physical condition and weight loss goals, increasing the intensity, speed and incline levels to match your long-term fitness plans. With an interval training on a treadmill you have less risks of injuries, as you do this workout on an elastic, controlled surface with low impact on your joints. Here’s a practical example of such a workout. Set the timer for 30 minutes and begin by walking at a slower-than-normal pace for 3 minutes as a warm-up. At this pace, you should be able to talk at a comfortable level – to your exercise buddy if you’re at the gym, or to your kids or pets if you’re at home. Next, speed up to a moderate pace for 5 minutes. It is at this point that your heart rate increases and you’ll start to lag on carrying a conversation. Follow with a brisk jog for 5 minutes. Although this is not your fastest speed, you are really just catching your breath and you definitely can’t hold a conversation in any way. Then, slow down to a moderate pace for 5 minutes, then jog briskly for 3 minutes, slow down again to a moderate pace for 2 minutes, then do a final brisk jog for another 3 minutes. Wrap up this interval training exercise with 4 minutes of slowing down gradually, until you reach the point where you can resume talking with your conversation partner.